since we have such nasty weather for half the year I would rather not have to go out to a different building to work on the layout. I did consider it, I really like what Mark Chase has done, but I think for me it would work better to have it attached. I also did not want to block the view of the woods behind the house. while I am waiting on the future of the layout I am working on other stuff. I finished the hopper car upgrades and they are all back in service. 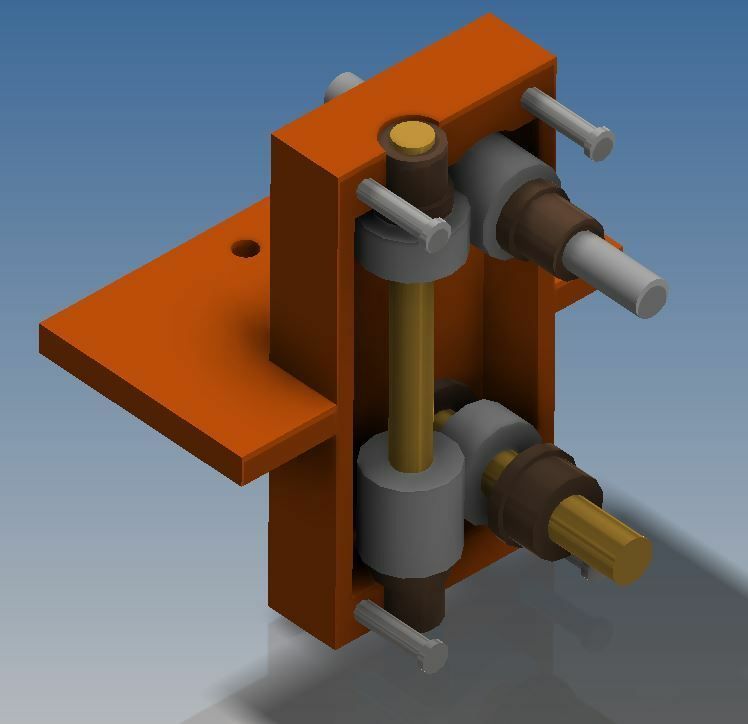 I am still testing the Sergent couplers and I will post the results when I know more. In the mean time I am still working on Shay #2. I found a defective gear in the rear truck and I am waiting for a new one to be shipped. I started to do some more planning and designing on the Heisler. When Brian Bond and I visited Cass I took a lot of photos and measurements of the Heisler there. I used that information to redesign my new brass cab for my Westside Heisler. I will use my 3D designs to make flat patterns and I will etch the cab as I did for shay #2. I also did the final design for the gear box. I designed a drive that used a coreless motor and a chain drive. The drive was very quiet but a bit on the slow side and it bucked like made going down grade. 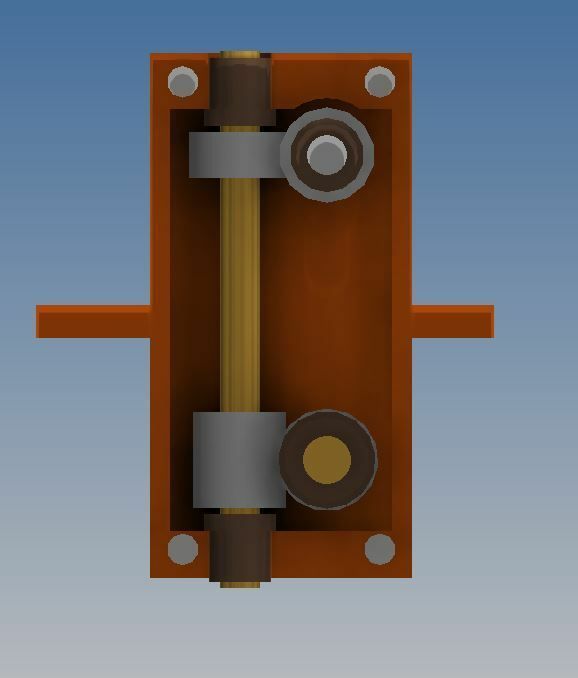 Given the trouble with Wow decoders and coreless motors I decided to try and design a drive that uses a 5 pole can motor. The original drive in the Heisler was a double worm drive, which worked fine except it was designed for an old open frame motor that ran about 17,000 rpm. Can motors don't get much above 10,000 rpm in a size small enough to fit in the tender space. 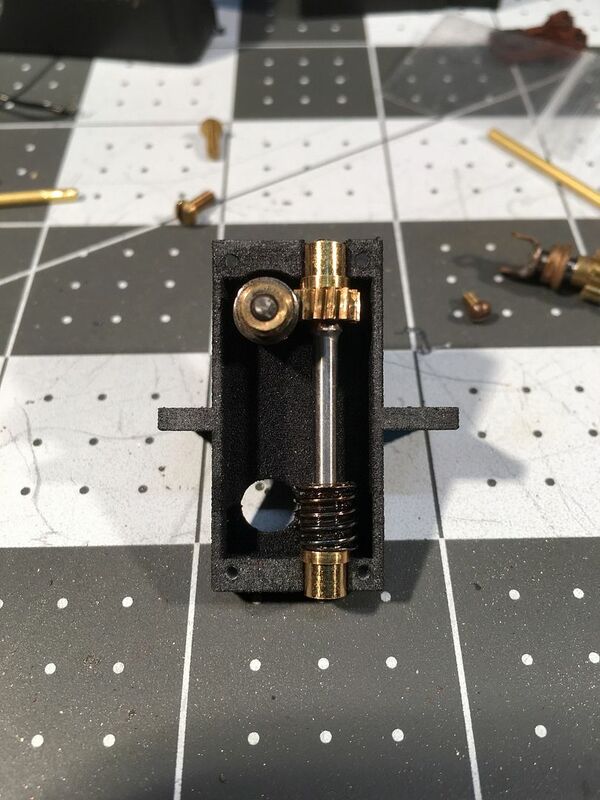 I used two 14:1 NWSL worm gear sets and some 2.5mm bushings to copy the double worm drive with a different gear reduction that I hope will be a better speed while retaining the power. here is the new double worm drive. I am having Shapeways print the gear box. 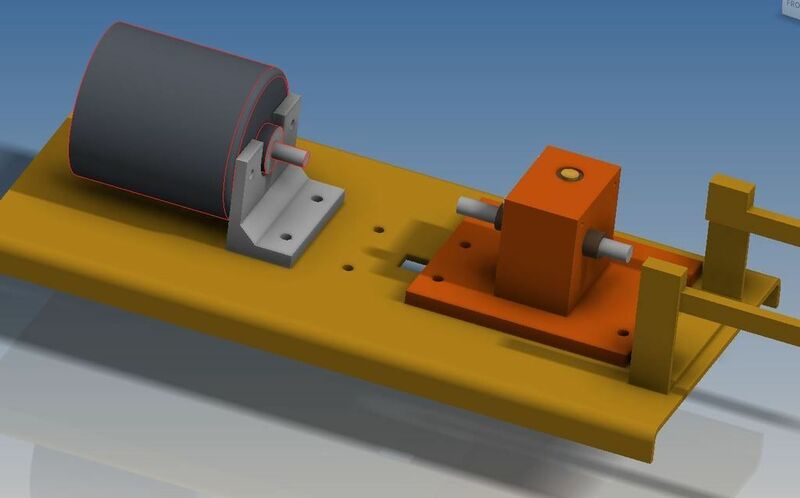 here is the gear box mounted on the Westside frame and the new NWSL can motor, the motor mount is also being printed. all the parts are designed to attach to existing holes in the Westside frame. The input shaft diameter is 2.5mm and the output shaft is 3mm. I have been asked for a brass and soldering demonstration, maybe I will do a video series on this cab like I did for the coal hopper. Very impressive renderings on the Heisler. I can see why the chain drive idea occurred to you first. I guess there is no way the entire drive could be turned 180 degrees so the motor would be in the firebox. I am happy to hear you like my train room arrangement, I like it very much also. Before the shop was built in the back yard, I started building a shelf layout in the guest bedroom, keeping my tools in the closet. My wife could not tolerate the situation, and gave me permission to build the shop. If the doorway to your addition comes out of a more formal area of the house, you may run into the same problem I did with trying to do dirty layout building in a part of the house that stays clean. Also, you say you don't want to block the view of the woods ... which direction is the view of the woods? An elegant solution to the gearing issue. As to dropping the floor, no problem with the foundation wall properly waterproofed on the outside with drain tile (really a plastic hose with holes) and a back up sump pump inside -- you could put in the pit when built and wait to see if you need it but the pump expense is small. The stairs will fit nicely in the aisle next to the work bench. Fire code may require an egress window but it is not a sleeping room so you should be OK. The chain drive had the motor in the fire box and it fit ok but it really makes removing the boiler a bit of an issue. I think this can motor is a little bigger than the firebox, if not I could flip it around because the input shaft can go either direction. which direction is the view of the woods? the woods are just outside the left edge of the aerial photo. between the pool and the woods the land rises up about 5', then there are woods and the land falls down to a pond. The door to the train room (if build) would be in an area that is the entry way from the garage, so really it would work well hauling things in and out from the garage because now I have to haul stuff through the house. I an interesting twist I was just talking to a VP in the company I work for and in 3 years they are moving the business, so I may be moving after all. He said they will make a final decision in 6 months because there is a plot of land they need to buy if they are going to go through with it. It would be just my luck to finally get a good spot for the layout and have to move. Putting my Realtor hat on -- if you move, a proper train room is a priority in new home selection! 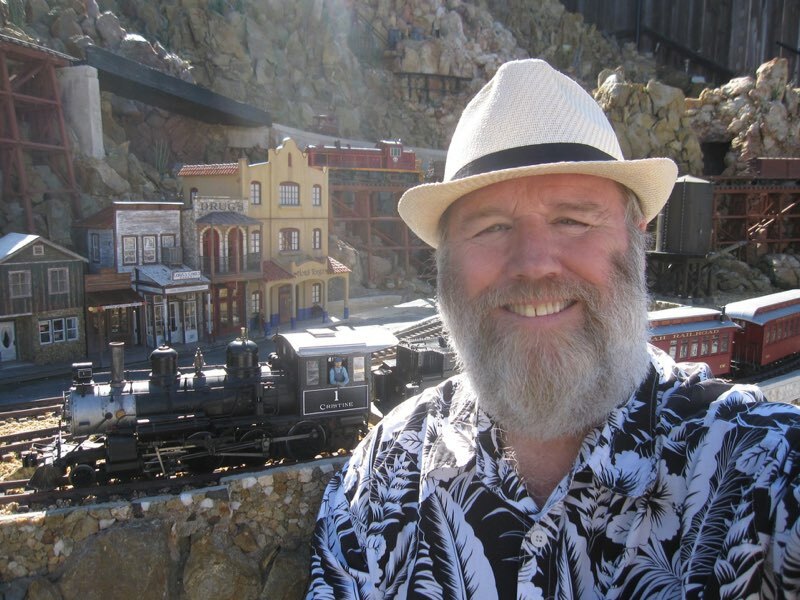 On one of our corporate moves in years gone by, I got rid of "the best Realtor in town" when she did not understand why I wanted such a space -- to her a train layout was a loop around a Christmas tree! Hotel internet system and RRL are not getting along! Any chance the 'plot of land' your company wants to buy is in Virginia? Ho boy, that would be SHWEEET! I have a lot to update on, I will try and keep it short. first, the addition to the house is not going to happen, too much cost and trouble for too little gain. My son is close to moving out and when he does I have been granted expansion rights into the next room, which will double my space, but more on that when it actually happens. I got my gearbox from Shapeways. I had it printed in black material, which is actually white with an outer coating of black. I found it is cheaper to combine all the parts with sprues because Shapeways counts it only as one part. you can see the white areas with I cut the parts from the sprues. here is the gear box with the parts installed. as good as this drive looks, it does not work. Actually, it works well but it is too slow. I decided to take a second look at the chain drive I had designed and reinstalled it. I did not like this drive because there was way too much overrun in the chain on the down grades but I did a test with the chain being tighter and it worked much better. So I am sticking with the chain drive, which is nice because the motor will be in the firebox leaving the cab open for details and the tender open for a speaker. where you may only see a piece of brass, I see a cab and tender. 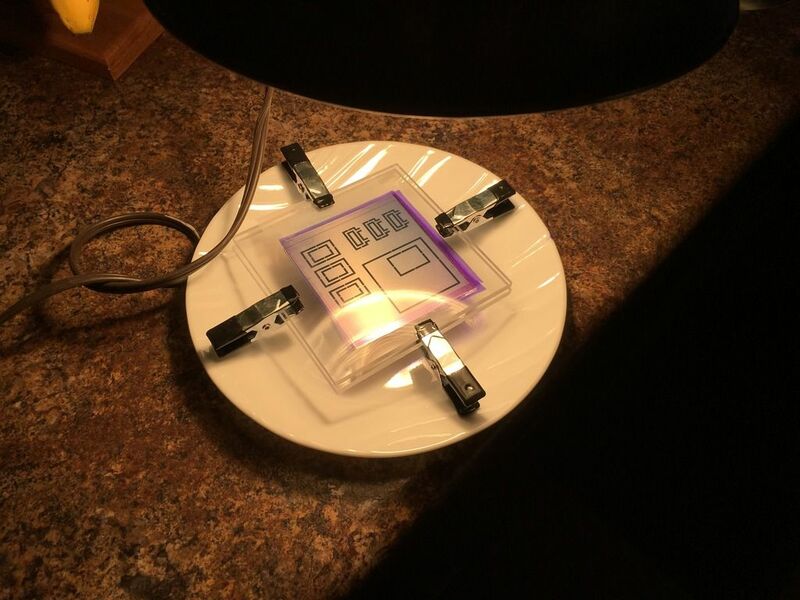 I designed a new cab in Cad and printed out the artwork on the Micro Mark clear sheets and began the etching process, which is pretty easy once you understand the steps. The hardest part by far is getting the drawing. 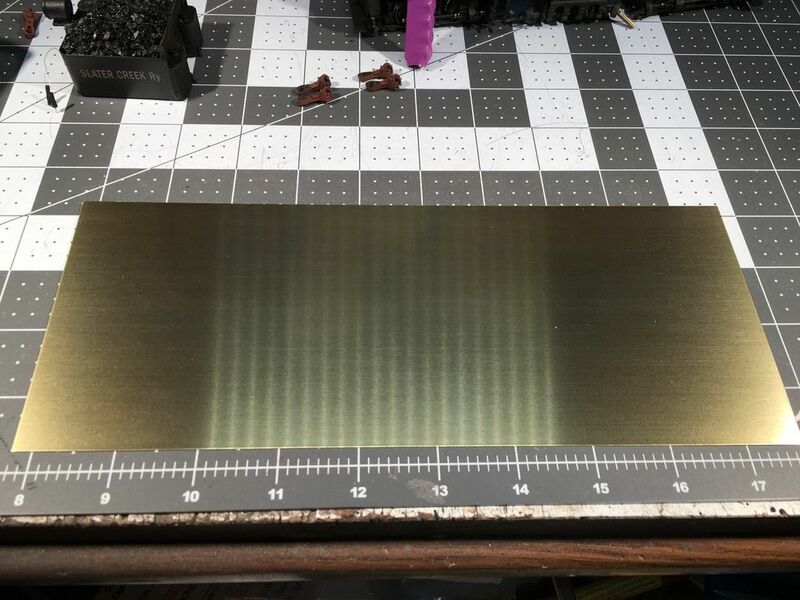 here is a small piece of brass being exposed with a photo flood lamp, it only takes a few minutes under the lamp to make the exposure, you have to flip it over and do both sides. 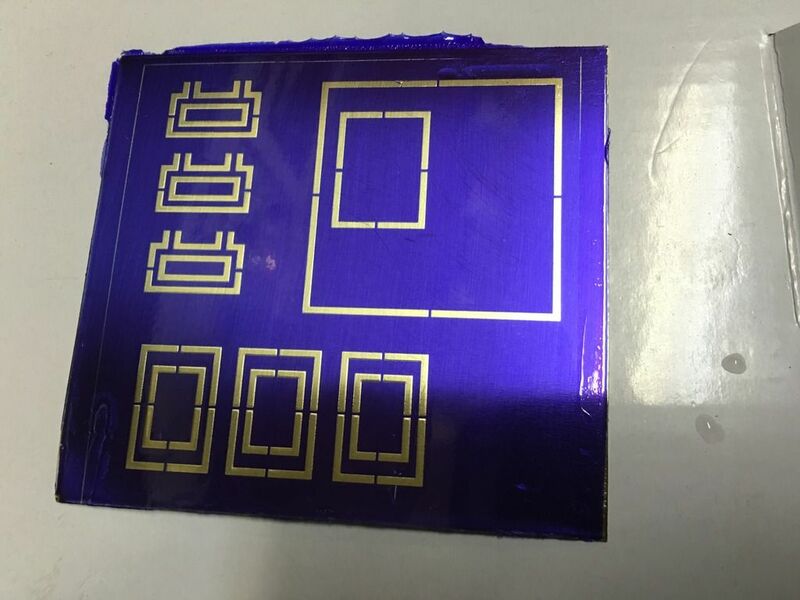 here is the exposed sheet of brass, the film is a very light blue when you apply it to the brass, but after it is exposed it is a dark purple blue. The first cab I made I did all on one big sheet, but it is much easier to keep the pieces down to 3" square or less. Also, by using smaller sheets if I make a mistake I only have to do one piece over again. next is a dip in the etching tank, which I forgot to take a photo of. I have the tender sides to do yet so I will get some photos of that when I do it this week. Etching 0.015" brass takes a long time, over 30 minutes to get the lines to cut all the way through. I like 0.015 for my cabs because they are very ridged, which is nice because I use real glass in the cabs and if someone picks up the model by the cab it won't flex and break the glass. I may try a 0.010 cab just to see if it works better when etching. Last but not least, I finally got Shay #2 put back together, what an adventure. 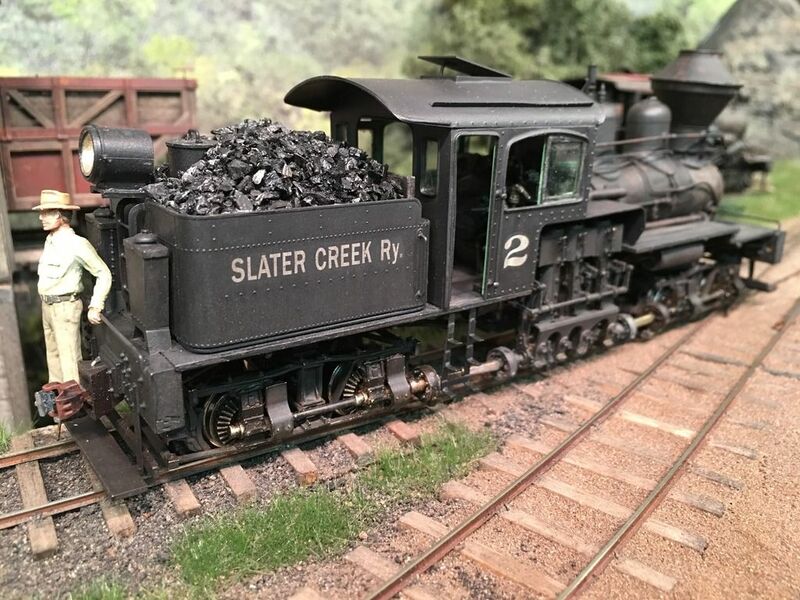 I had a strange issue when I would run this shay, it ran great until I connected some freight cars to it, then the gears skipped. I tried everything and I almost gave up on it. One morning I just took the rear truck off of it and sat and looked over every bit of it under magnification. What I found was one gear had part of the tooth missing. There was enough of the tooth to grab when the shay was running light but under load it would get to the missing tooth and sit and spin. I got a new gear set and installed them and she ran like a champ. I installed a micro Loksound V4.0 decoder in it and all is going well. here is are a couple videos of #2 in action. Etching brass is one thing I've never tried but occasionally wonder if I should. you should! The hardest part is the art work, after that it is just a bunch of easy steps. 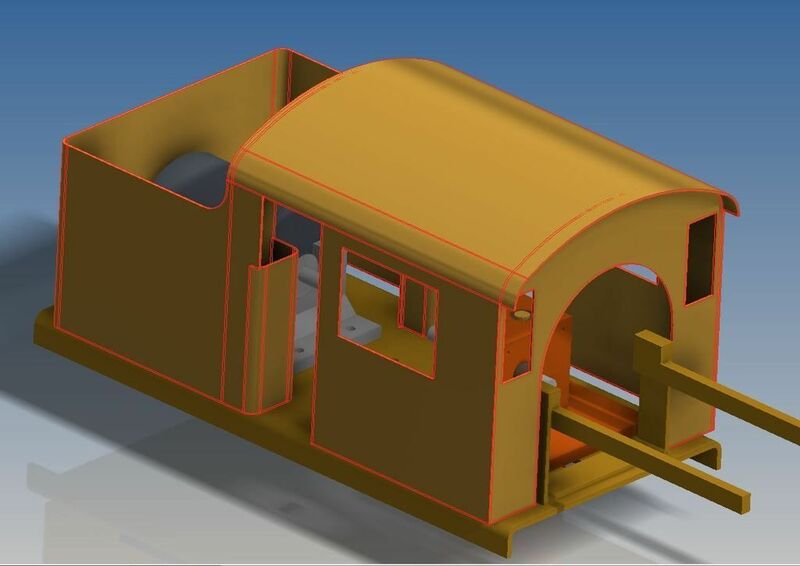 These days having the ability to use CAD will give modelers a huge edge. 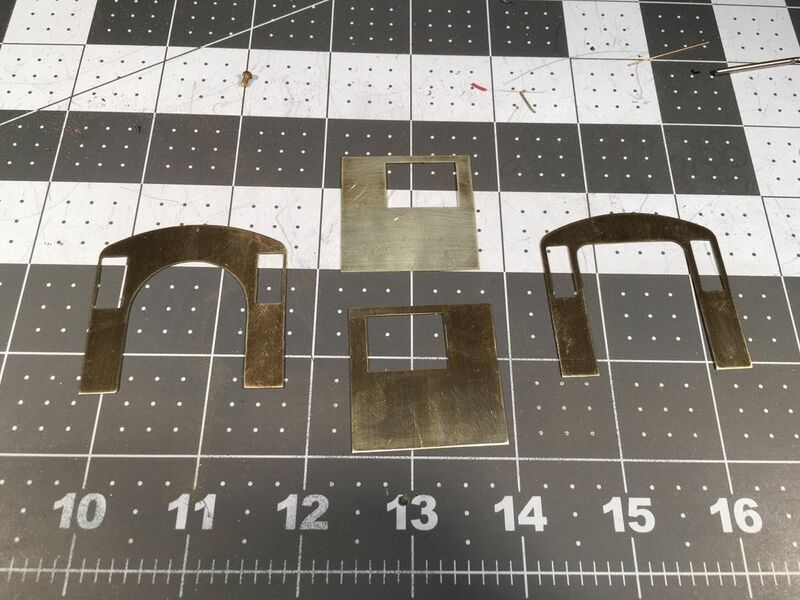 The nice things about working in brass is that the models are durable and construction can go fast, no glue to dry. not much to show yet, still making cab parts for the Heisler and testing #2. 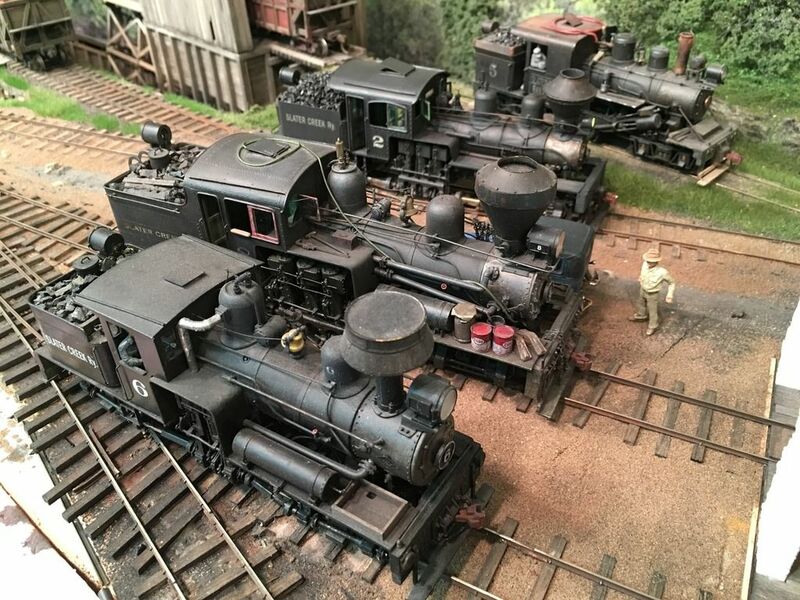 Shay #2 can handle only 6 empty hopper cars and a caboose up the switchback. Here is a little video of #2 returning with 5 loaded hopper cars. I am still testing the Sergent couplers. I am getting more used to them and I think I will stick with them. I still have not decided on if I like them self centering or not, time will tell on that one. Great work! Always enjoy your updates even if i rarely comment. 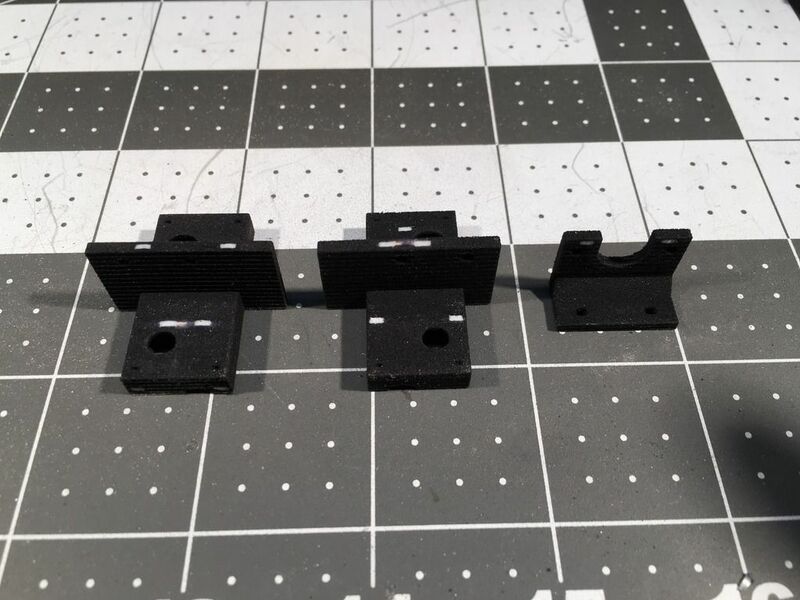 Couple questions, how well do you think the 3d printed gear boxes will hold up? 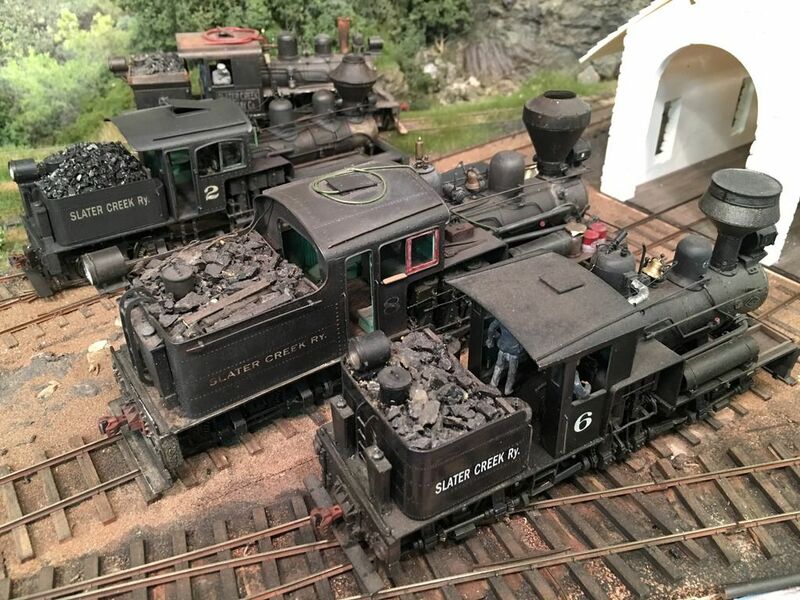 I've often hear about issues with smaller engines with plastic frames, so im curious about the printed gearboxes, also, what CAD are you using for the cab parts? I've recently been working with a design house for a work related project (When wax carving just wouldn't cut it) that'll eventually be 3d printed for casting in bronze, but as you say, CAD work can really be a boom for modelers and i have a tonne of ideas that could be fun but it'd be nice to create these for myself and not spend �40/�50 an hour for design work.